For those of you who have never had a class at the time in school, college or learn about algorithms and flowcharts, perhaps for the first term you hear. This branching actual term to describe the process flow of a program branching. In the flow charts, logic "IF ... THEN" described in the form of branches. Because of that, this is called branching. In addition to branching, these structures are also referred to: control flow , decision , structural condition, structure if, etc. Branching will make the program be able to think and decisive action in accordance with the logic / conditions that we provide. Branching if a ramification which has only one block selection when the condition is true. "If the total expenditure is greater than $100,000, then display a message Congratulations you get a prize"
If less than $100,000 how? Yes messages are not displayed. This is called a block. Once inside there is only one row of blocks expression or statement, it can not be written with curly braces. Branching if / else is a ramification that has two blocks of choice. The first choice to correct the condition, and the second choice for the condition is false (else). It is a flowchart for checking a password. If the password is correct, the message is on the green blocks will be shown: "Welcome boss!" But if false, then the message is in the red block which will be displayed: "Password incorrect, please try again!" Then, the message is in the gray blocks will still be displayed, because he was not part of the branching block if / else. Note the direction arrows, each block if / else leading up to it. Branching if / else / if a branch that has more than two blocks of choice. It is a block for branching if / else / if. We can add a lot of blocks in accordance with what we want. 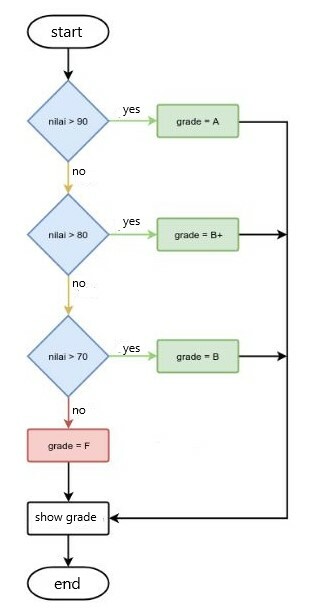 if(nilai >= 90) grade = "A"
else if(nilai >= 80) grade = "B+"
else if(nilai >= 70) grade = "B"
else if(nilai >= 60) grade = "C+"
else if(nilai >= 50) grade = "C"
else if(nilai >= 40) grade = "D"
else if(nilai >= 30) grade = "E"
In the program above, we do not use curly braces to create a block of code to if / else / if. Branching switch / case is another form of branching if / else / if. We can create a block of code (case) as many times as desired in the switch block. In <value>, we can fill with values ​​that will be compared with the variable. Each case must end with a break. Especially for default, does not need to end with a break because he was located at the end. Giving a break intended to make the program stop checking other cases when a case is met. First of all, we give a true value on the switch, so that we can enter into the block switch. Then in the switch block, we create the conditions by using a case. The result will be the same as in the example of branching if / else / if. Branching using ternary operator is another form of branching if / else. Abbreviated form of the if / else. The function of the method toUpperCase () to change the text in the input into capital letters. If the condition is in parenthesis- (aswr.toUpperCase () == "YES") - is true, then later the contents of the variable will be the same answer with "Yes". But if it is false, then variable will contain the answer "False". We also can make in branching branching block. This is called branching nested or nested if. Branching nesting, we can actually create more simply by using logical operators. We can make this simpler with the logical AND operator (&&). However, this is not the best solution. Since we can not check whether the user is registered or not.